Newcastle newspapers The Chronicle, The Journal and The Sunday Sun are moving to a new office after 52 years at Thomson House in the city’s Groat Market. 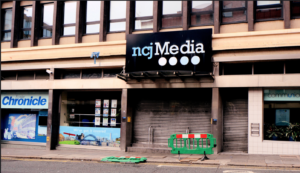 Trinity Mirror's NCJ Media, which owns the publications, is moving to new headquarters at Eldon Square, less than half a mile away from their former home, in early 2018. The organisation has been based in Newcastle city centre since The Journal was first published in 1832 by Hernaman and Perring on Pilgrim Street. Robert Cuffe, Managing Director for Trinity Mirror North East, said: “This is a fantastic move for our business, locating us right in the heart of the city and in an iconic location. When NCJ Media relocated to Thomson House, a booklet was produced to mark the move that said ‘the news of the North and of the whole world' would 'pour in night and day’.